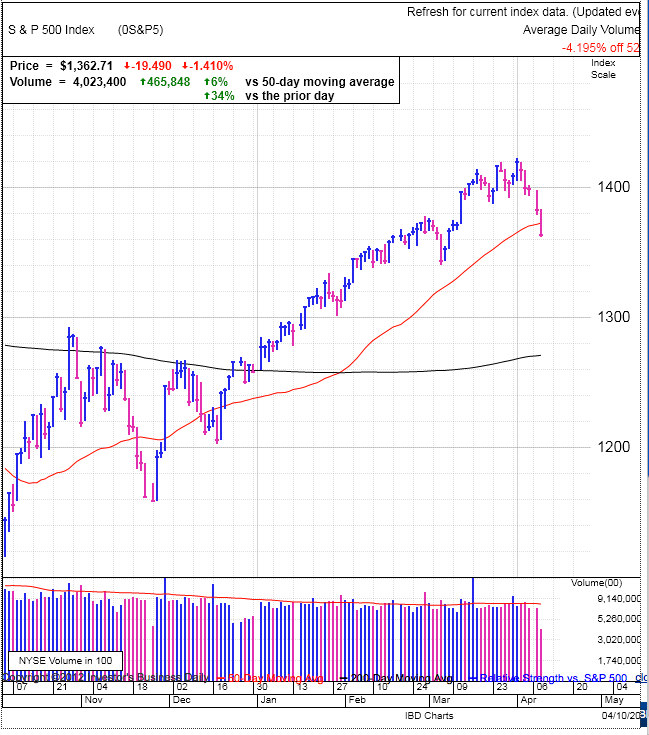 S&P500 daily chart breaking the 50dma. Rough morning for the markets as the SPX opened above the 50dma, but soon sliced through it on elevated volume. The period of complacency is quickly coming to an end and there is a lot of stop-loss selling as we fall through the recent support level of ~1370. Of course the ironic thing is this accelerated selling is exactly what we need in order to find a bottom. The rush for the exits will allow us to flush out the weak holders and set the foundation for a bounce once this surge of selling exhausts itself. For anyone sitting on cash, hold tight for the moment as the selling might not be done just yet, but we are getting closer to the point of maximum pain that will trigger the bounce. Now is the time to start looking for buying opportunities as other people are cutting bait and rushing for the exit. Their impulse is your opportunity. But while we will see a bounce over the new few days, the bigger question is if this bounce will resume the uptrend, or be a sucker’s rally before turning lower. At this point it is hard to gauge because we still have not had a chance to get a sense of investor attitudes after the sell-off and bounce. The more fearful the sell-off is, the better the probability for a sustained bounce afterward. But if we get too many buy-the-dip people rushing in too soon, we’ll probably have some additional downside remaining and will probably see a two leg correction. So until we have more information, it would be best to view the upcoming bounce as a short-term trading opportunity and then let the sentiment and price action determine if you need to cash out for a quick profit or hold on for more gains.